This novel depicts how two high-school girls, whose characters are opposite to each other, dedicate their youthful passion to Kendo. Its second and third volumes are titled "Bushido Seventeen" and "Bushido Eighteen," respectively. One girl, Sanae, used to do traditional japanese dance (Nihon Buyoh) but changed her interest to Kendo. Partly due to this background, Sanae's style is somewhat "soft." The other girl, Kaori, is a Kendo elite and her style is "hard/strong." The novel starts with a scene where the two girls fight a match at Yokohama Citizens Tournament just before they finish their middle school, when Sanae beat Kaori. These two rivals started to go to the same high school. Kaori long remembers the frustrated feeling she experienced when she was defeated by Sanae, while Sanae almost forgot that event. Then the two grow up practicing Kendo and challenging each other. The manga version of this novel was serialized in two monthly magazines, Gekkan Afternoon (Kodansha), and Deluxe Margaret (Shueisha) since May 2009, and a movie was released in 2010. In this book, you can find the detailed descriptions about regular Kendo practices that we are now doing, as well as more advanced techniques. Each one of you must have learnt a lot from the CJKC (Col-ken) Cup the other day. Some might have had satisfactory results, and some might have had a frustrated feeling that they couldn't do their very best. Then, how can one be strong at Kendo matches? For the next few blog entries, we will talk about tips that can make you strong. Today's tip: Get ahead of your opponent to give a strike, preempt! Be cautious even after you give a strike (take zan-shin) ! To preempt means to be more ready and more confident than your opponent in giving a strike. You need to be ready to give him/her a rapid and accurate attack before he or she gives you a strike. To take zan-shin means to have a cautious posture and preparedness against your opponent even after you give a strike. If you don't have those two things ---a cautious posture and preparedness against your opponent ---- in your heart, you cannot win. The same thing is true of your daily life. When you go to the dojo early and start checking your shinai before the practice starts, you can be ready for your next action. That will be the same as pre-emption (going ahead). When you do not forget but review the practice you learned at dojo or at school, or when you stay careful and tidy even after you finished something, you are doing the same thing as taking zan-shin. Please try to be conscious of these tips in your daily life! Recently, many of you may have seen postings on various Internet websites suggesting the “origin of Kendo is in Korea and not Japan.” The All Japan Kendo Federation (heretofore, AJKF) has not bothered to reply to these assertions, because we think Kendo is a culture characteristic of Japan which developed from the life and spirit of the Samurai ( or Bushi, synonym of Samurai ) of Japan. However, since the above-mentioned assertions seem to be increasing, we feel that it is necessary to make a formal statement of our opinion and position so that it may be known to you all. Battles with the use of swords began with the discovery of iron and the development of the iron sword. The shape of the iron swords and their handling methods have changed with the passage of time. To begin with, cultures of all regions influence each other from the movement and exchange of goods and people, and eventually develop over a period of time. And, gradually it becomes a culture that is known throughout the world beyond races and the borders of countries. During the 15th and 16th centuries (during the era of warring states and the early Tokugawa Era), many schools of Kenjutsu were established, and in the 18th century (in the middle of the Tokugawa Era) Kendo-gu was developed. As a result, a new Kenjutsu training method using Shinai (bamboo swords) was established, and a new type of Kenjutsu competition gained popularity in the local Dojos and spread across the country in the middle of the 19th century (around the end of the Tokugawa Era). Early in the 20th century (after the Meiji Restoration and in the beginning of the Taisho Era), this type of training which was referred to as Gekiken or Kenjutsu was renamed Kendo. And, Kendo was said to represent Budo which was based on the spirit of the Japanese Samurai. In this manner, Kendo that we know now is the Kendo that developed through this long historical process. The AJKF will engage in the promotion of Kendo or what can be considered as Budo, a culture of Japanese distinction. Promotion of Kendo neither means merely to increase the number of Kendo practitioners, nor to hold more competitions. The AJKF believes that promotion will involve the communication of the “spirit of the Samurai” through everyday training and competition. Kendo should not be promoted just as a competitive sport. With this in mind, there is one thing that needs to be understood by those engaging in Kendo around the world. And that is, through the harsh training of Kendo, our hope is that you learn not only the technical skills of the sword, but to understand the social and ethical aspects of the Samurai as well as the spirit (mental attitude) of the Samurai. In other words, we hope that you will understand Kendo as Budo and to experience the training of it. A Shinai is a Samurai’s sword. Keiko-gi and Hakama are a Samurai’s formal attire. They should not be considered simply sports-wear. Without understanding this “spirit,” Kendo will merely be another physical exercise. We hope that you will try to understand and appreciate the profundity and cultural values of Kendo. 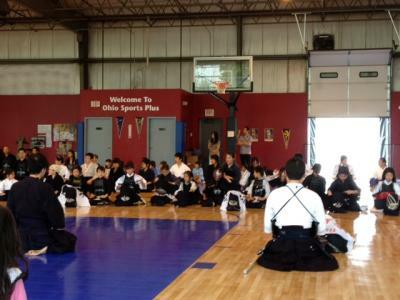 The AJKF hopes to promote what we believe to be authentic Kendo. We would like to ask for your full support and cooperation to our activities.